If you are seriously hurt or a family member dies as a result of an accident of any type, you need to consult an attorney. Our firm has handled hundreds of major personal injury and worker's compensation cases and has recovered millions of dollars on behalf of our clients. 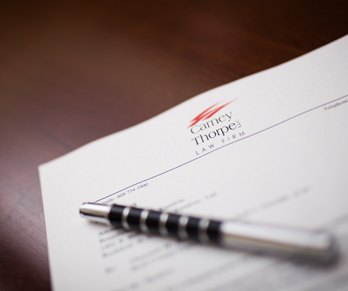 The attorneys and staff at Carney Thorpe will give your case the attention it deserves. If you or a loved one has been injured, call us for a no-obligation consultation to discuss your case. Business owners face unique challenges and we work closely with our business clients, not only to understand those challenges, but also to understand their business. Our business attorneys offer an extensive range of services to companies of all types and sizes. Whether you are a new entrepreneur looking to start your first business venture, or an established, multi-faceted company, our priority at Carney Thorpe is to provide professional and reliable business counseling. Whether you are a defendant or plaintiff, business or individual, no one will prepare your case for hearings, arbitrations, mediations or trials more thoroughly than our civil and litigation lawyers at Carney Thorpe. We understand the commitment, vigor and tenacity it takes to represent you through all litigation issues. We have decades of extensive trial experience, representing hundreds of individuals and businesses and obtaining favorable outcomes for our clients. Real estate transactions range from the routine sale and purchase of property to complex residential and commercial developments. Regardless of the size of your project, our goal is to provide our clients with the information and guidance they need to successfully complete their transaction. The real estate attorneys at Carney Thorpe are committed to excellence and providing sophisticated legal services and advocacy for all of your real estate needs. commercial. Our firm is committed to providing exceptional legal service to our clients. We enjoy the practice of law and the ability to problem-solve for our clients. Client service. Client Success. This is our focus.